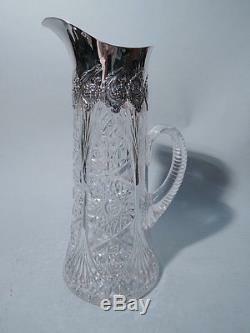 Tiffany Sterling Silver and Brilliant-Cut Glass Claret Jug C 1890. Brilliant-cut claret jug with sterling silver mount. Made by Tiffany & Co. In New York, ca 1890. Spread base and notched c-scroll handle. Allover cut ornament including foliage and stars. Silver mount with helmet mouth and chased foliate-scroll border. Very nice condition and patina. Dimensions: H 13 x W 7 x D 6 in. BO384 Nelson & Nelson Antique Silver has been serving the Antique Lovers for 35 years. We are able to offer the finest antique jewelry and silver from old estates located on the upper east side of New York City at great prices. We GUARANTEE all of our items to be as stated in the description. We only sell items of good design and condition. Custom listed using TROCADERO's automated HTML and Picture Hosting tools. The item "Tiffany Claret Jug Decanter American Brilliant Cut Glass & Sterling Silver" is in sale since Friday, February 26, 2016. This item is in the category "Antiques\Silver\Sterling Silver (.925)\Bottles, Decanters & Flasks".